AutoStandByPro will help to put your computer to a lower power state. Auto Standby Pro 2.16 was available as a giveaway on May 28, 2016! AutoStandByPro is a lightweight, intuitive and user friendly rule based utility that will help you to reduce your electricity bills by putting your computer to a lower power state when it is not needed. AutoStandByPro is an extension of the power management system that is already present on a Windows computer, but with better and more comprehensive features. With proper use AutoStandByPro will help you to effectively manage the power requirements of your computer. With AutoStandByPro you can Shutdown, Restart, Sleep, Hibernate, Lock Computer, Log Off User, Prevent Sleep/Hibernation, Prevent Display Sleep or execute a Custom Action using a combination of different conditions such as Date/Time, Computer Display, User/System Process, Windows Service, User/Keyboard/Mouse Activity, CPU/Disk/Network/Download/Upload Activity, Reachable Devices on the network, Power Requests and Http Get/Post Requests. Additionally AutoStandByPro can Wake Up a computer from a sleep state based on different date/time user defined schedules (Features Explained). How would you improve Auto Standby Pro 2.16? You all complain about the return on your money, but what about the footprint on Mother Nature? Don't you guys think it is worth while to invest 30 bucks to save some co2 emissions and keep the world that much cleaner? If all the millions of computers round the world would make sure to reduce the power consumption when possible that would really make a great difference on the ozone layer!! BTW All those mentioning about how much you gain from the one year free version, I didn't see any mention about it expiring after one year. Did I miss something? Hey guys, You all complain about the return on your money, but what about the footprint on Mother Nature? Don't you guys think it is worth while to invest 30 bucks to save some co2 emissions and keep the world that much cleaner? If all the millions of computers round the world would make sure to reduce the power consumption when possible that would really make a great difference on the ozone layer!! BTW All those mentioning about how much you gain from the one year free version, I didn't see any mention about it expiring after one year. Did I miss something? I really like this program. But I guess that depends on what your uses might be. When running this software for the first time, I would suggest cancelling the offer to use the "SMART PROFILE WIZARD" which pops up when first running it, and using your own profile to start with. This should be made clear to anyone when starting it, but I suspect a lot click next without reading and not knowing that it changes their sleep settings and such. That being said : On first run my suggestion : "Click CANCEL on the Smart Profile stuff". A few settings you might wanna change with this program, go to TOOLS/SETTINGS and "UNCHECK" Check for updates, because if you don't it may bug you to update and if you do you will lose your license. Another setting to "CHECK", go to TOOLS/Settings and "CHECK" the option "SILENT MODE", this way everytime it loads with "Windows 10" which I use and perhaps other OS's it wont show you that POP UP screen when loading telling you that it is minimized. This is a really good program. I use it to add rules for a few programs where I watch movies, like my browser, I added a rule to where when my browser is running it will prevent display sleep, so if I am watching a streaming movie over my browser it wont put my screen to sleep. This way it let's me keep my screen saver settings as is. Also have my media player setup to do the same. I like this software, although I wish there were a few more features for this software. Like for one, instead of being limited on sleep or other options to DATE ONLY/TIME, Add a DAILY or WEEKLY option, also while I know how to do this myself, adding the creation of a shortcut to put your PC in a certain mode like SLEEP/SHUTDOWN/HIBERNATE/Etc.... would be really nice for novice users. Overall, this is a really good program in my opinion, it has a lot of room for upgrades, but it does the job I want it to do and seems to do it very well. Thanks you Phenominal Solutions & Giveaway of the Day!!! This is a keeper!!! And With continued development and more additions I will consider purchasing in the very near future. I really like this program. But I guess that depends on what your uses might be. When running this software for the first time, I would suggest cancelling the offer to use the "SMART PROFILE WIZARD" which pops up when first running it, and using your own profile to start with. This should be made clear to anyone when starting it, but I suspect a lot click next without reading and not knowing that it changes their sleep settings and such. That being said : On first run my suggestion : "Click CANCEL on the Smart Profile stuff". A few settings you might wanna change with this program, go to TOOLS/SETTINGS and "UNCHECK" Check for updates, because if you don't it may bug you to update and if you do you will lose your license. Another setting to "CHECK", go to TOOLS/Settings and "CHECK" the option "SILENT MODE", this way everytime it loads with "Windows 10" which I use and perhaps other OS's it wont show you that POP UP screen when loading telling you that it is minimized. This is a really good program. I use it to add rules for a few programs where I watch movies, like my browser, I added a rule to where when my browser is running it will prevent display sleep, so if I am watching a streaming movie over my browser it wont put my screen to sleep. This way it let's me keep my screen saver settings as is. Also have my media player setup to do the same. I like this software, although I wish there were a few more features for this software. Like for one, instead of being limited on sleep or other options to DATE ONLY/TIME, Add a DAILY or WEEKLY option, also while I know how to do this myself, adding the creation of a shortcut to put your PC in a certain mode like SLEEP/SHUTDOWN/HIBERNATE/Etc.... would be really nice for novice users. Overall, this is a really good program in my opinion, it has a lot of room for upgrades, but it does the job I want it to do and seems to do it very well. Thanks you Phenominal Solutions & Giveaway of the Day!!! This is a keeper!!! And With continued development and more additions I will consider purchasing in the very near future. Just another suggestion for settings for this software. The Author should add a few command line options to the software to schedule for software's like "CCLEANER" and such. While I know how to do such things because I am experienced with PC's, it would be a nice feature to add a command line option feature. Or here is an example : Select a predefined software name, then select a command line option, then select a TIME meaning hourly or monthly or day or once every day or once every week. Windows Task Scheduler is rather limited, and this program has the potential if the Author makes some changes in my opinion to replace it. Tested it under a few different circumstances and it worked, so can't say more than that. Created a spreadsheet in the attempt to analyse the usefulness of a program of this type. Certainly with a 350 W desktop computer running eight hours a day a realistic payback time is achievable. Having said that, it very much depends upon the circumstances under which the computer is run. My gut feeling is it's a waste of money, but the spreadsheet only caused doubts. This is surely a niche program for a select few users who require such intricate control of their computer. The usual power options in Windows or other OS get the job done for most of us, do they not? I'd view this software as a complete waste of money. The power usage on a modern personal computer if left on 24 hours a day is approximately $.87 a month based on our rates in Tampa and my Dell Laptop and PC. Using the windows included software and tailoring it to my usage of having the PC's running full probably 3 hours a day and in a hibernate or standby setting for the rest reduces that to approximately $.06 a month. At $30 for the software my payback would be 41.66 years. Obviously no cost for the free year but where is the need to add another piece of software to an existing piece for $.72 cents savings during even the "free" year? Not for me. I obviously don't need this. My AC power supply to PC is OFF after the PC is turned off. Saving electrical energy when my desktop PC is turned on and I am using it? No chance. Don't even think about it. I don't want anything to mess with the PC hardware and the electrical energy that they need to function properly. This is stupid and it is a false economy. You may "save" 30 cents over the period of 10 years in electrical energy cost. But you can do serious damage to your PC hardware by strangling it of the energy it needs to run properly. In addition your PC may crash due to sudden imposition of auto standby mode, when you are working on something very important. This constant auto standby and waking up from auto standby is not good for the PC. I obviously don't need this. My AC power supply to PC is OFF after the PC is turned off. Saving electrical energy when my desktop PC is turned on and I am using it? No chance. Don't even think about it. I don't want anything to mess with the PC hardware and the electrical energy that they need to function properly. This is stupid and it is a false economy. You may "save" 30 cents over the period of 10 years in electrical energy cost. But you can do serious damage to your PC hardware by strangling it of the energy it needs to run properly. In addition your PC may crash due to sudden imposition of auto standby mode, when you are working on something very important. This constant auto standby and waking up from auto standby is not good for the PC. ric, you're absolutely right, turn off the PC is better. The current Windows 8.1 en 10 start up faster. I saw nothing in the website's description of the software that indicated it somehow throttles the power going to the various components of your computer. It merely expands the power options that come with Windows to a more granular level. If one has a 350w power supply that doesn't mean it's always using 350w. The PSU dynamically supplies the PC with the necessary power needed to accomplish whatever tasks the computer is doing. Unless you have a high-end gaming rig power usage during standby is going to be considerably less than the maximum power rating of the PSU. Yes, turning off your PC when not in use will save power (even when powered down a computer is drawing a small amount of power unless you hit the power switch on the back of the PC or shut down the AC going to the PSU). However, there's a trade-off -- computers tend to last longer when left on all the time. I saw nothing in the website's description of the software that indicated it somehow throttles the power going to the various components of your computer. It merely expands the power options that come with Windows to a more granular level. If one has a 350w power supply that doesn't mean it's always using 350w. The PSU dynamically supplies the PC with the necessary power needed to accomplish whatever tasks the computer is doing. Unless you have a high-end gaming rig power usage during standby is going to be considerably less than the maximum power rating of the PSU. Yes, turning off your PC when not in use will save power (even when powered down a computer is drawing a small amount of power unless you hit the power switch on the back of the PC or shut down the AC going to the PSU). However, there's a trade-off -- computers tend to last longer when left on all the time. It is the memory banks that run hot and burn tremendous amount of power, the CPU is second when running full blast and then come video. CPU can be lowered to stand by power but not the memory banks. Something to think about when jumping to conclusions. I have 64 GB of dram and they use 90% of the power in my computer. It is the memory banks that run hot and burn tremendous amount of power, the CPU is second when running full blast and then come video. CPU can be lowered to stand by power but not the memory banks. Something to think about when jumping to conclusions. I have 64 GB of dram and they use 90% of the power in my computer. It installed fine, on my Win 10 x64 Home edition, but as "micksmixxx" wrote, it is the standard version, with no apparent way to activate the Pro version. I have windows 10 which has a load of power options along with Start menu X which has additional power options. So I am not in need of any more power options. In any case I set everything to Never and the screen to 100% brightness and still get 4 hours out of a battery charge on my HP15. So my 41 watt hours of electricity used over 4 hours costs next to nothing. It would take many years to recoup the $27.99 that the program costs! I have windows 10 which has a load of power options along with Start menu X which has additional power options. So I am not in need of any more power options. In any case I set everything to Never and the screen to 100% brightness and still get 4 hours out of a battery charge on my HP15. So my 41 watt hours of electricity used over 4 hours costs next to nothing. It would take many years to recoup the $27.99 that the program costs! For those adding the unhelpful comments along the lines of 'just turn it off', I think this will have its uses such as if you are downloading something but need to go out or to bed. If you don't want to interrupt the download just set the timer to a predetermined time and the computer will shut itself down having allowed a period for the download to complete. For those adding the unhelpful comments along the lines of 'just turn it off', I think this will have its uses such as if you are downloading something but need to go out or to bed. If you don't want to interrupt the download just set the timer to a predetermined time and the computer will shut itself down having allowed a period for the download to complete. Most decent download managers already have a 'shut down when finished' feature, and they don't cost anything. Glenn, Most decent download managers already have a 'shut down when finished' feature, and they don't cost anything. How do you actually activate the Pro version? The Readme file simply states to run the Setup file to install and activate, but we're left with a Personal/Home Version. How about buying Energy Star computer components? Then you won't need this software to guilt-trip you into cutting back on your power-hog computer. I use Airytec Switch Off (free) with likely many of the options this program has. I use the delayed 'sleep' & 'restart' modes daily. I just give my lappy's power button a tap, and it's instant nite-nite time. Doesn't get any easier than that. Just installed on Win 10 Pro. It didn't make an entry in the Start menu, so I found it in the installed folder. I get a UAC prompt on launching, then nothing. Checked the tool tray too. The process appears to be running, and I can kill it, and launch it again, but still no UI. Seems it's not ready for Win 10? Just installed on Win 10 Pro. It didn't make an entry in the Start menu, so I found it in the installed folder. I get a UAC prompt on launching, then nothing. Checked the tool tray too. The process appears to be running, and I can kill it, and launch it again, but still no UI. Seems it's not ready for Win 10? I tried once more, and after quite a few minutes the UI came up. Not sure why, as CPU usage was not high. Seems to work now, setting up rules. pixelriffic, I tried once more, and after quite a few minutes the UI came up. Not sure why, as CPU usage was not high. Seems to work now, setting up rules. I don't see the point of this software as Keya23 stated the best way to save money is to turn of your computer when not in use or use the Windows Power Options which work perfectly well. I've downloaded and tried the program out and it works well enough, but couldn't find any valid reason to spend nearly $30.00 on this, it would take years, well a very long time to pay for itself. Uninstalled, simply because I've no need for it. It is convenience my friend. It sometimes nice to be able to have the computer shut down at a predetermined time when you are absent. Maybe a late-night backup after you have gone to bed. Lenny, It is convenience my friend. It sometimes nice to be able to have the computer shut down at a predetermined time when you are absent. Maybe a late-night backup after you have gone to bed. I've already got a little freeware program that I found way back when Windows 98 ruled the roost, it works of every version of windows (even 10) and you can set it up to shutdown, restart, disconnect from the internet, sleep or hibernate after a set period of time or at a specific time. I've used for years and it's never failed me yet. kc4cop, I've already got a little freeware program that I found way back when Windows 98 ruled the roost, it works of every version of windows (even 10) and you can set it up to shutdown, restart, disconnect from the internet, sleep or hibernate after a set period of time or at a specific time. I've used for years and it's never failed me yet. Lenny, can you share the win98 program you mentioned? Any one else has any tested FREEWARE that want to share their experience about them? Lenny, can you share the win98 program you mentioned? Any one else has any tested FREEWARE that want to share their experience about them? Thanks all ! I hate to point out something that is utterly obvious, but when I don't need my computer I just turn it off. That seems to solve any issues of excessive power consumption. I hate to point out something that is utterly obvious, but when I don't need my computer I just turn it off. That seems to solve any issues of excessive power consumption. I was willing to give this a go, thinking maybe it might help with a little overheating problem. After installation it took a while to find the shortcut and when i did, and clicked it, it threw up a window saying it couldn't find 'sch exe'. Who's got the time and patience to find out what was wrong? Uninstalled. With prejudice. I would suggest that you check out your hardware if your PC is overheating. Check your fans are running, especially the CPU fan. If they are fine then I'd maybe thing about upgrading your CPU's heatsink, especially if you are overclocking. Have a good weekend! Col, I would suggest that you check out your hardware if your PC is overheating. Check your fans are running, especially the CPU fan. If they are fine then I'd maybe thing about upgrading your CPU's heatsink, especially if you are overclocking. Have a good weekend! Col, Don't know if you have this problem, but there are too many office desks on the market that contain an un-vented, closed-door compartment for a computer tower, so that it can be "hidden away" from sight. This awful feature does nothing but contain all of the heat a computer tower generates, adding to overheating problems. As Lenny says: check your hardware. How old is the PC/laptop and how often is it put to work? I have a free PC, because the owner has bought a new one. The old one did work properly any more. Also the video has some diffulties; stripes etc. I installed the new PC; WiFi, internet, mail etc. And I was asked to take the old one home. At home I clean the fan's etc, also the fan of the video. After that the PC worked fine. I use it for tests. So check for dust in your PC while it is off. If it is a laptop it will more difficult, but often it can be opened to clean the input and output of air. it is best to block the fan from spinnig. Most of the time that will be enough. In other case it will help to set the CPU-speed on 80-85% of the max. Ootje, I blow the dust out, every two years in the Vista and the fans turn I just stuck with a piece of wood or another thing. I'll stick with Shutter (den4b). For those seeking something more than Windows standard 'Power Options' offers, this might be of interest. Getting $30sworth more -- the reinstall price of this software -- not so much. The developer needs to re-think its pricing. This would be the question: How much money in power savings would using this generate and how long would it take to offset the cost of the software? Before I install this I want information that gives an indication of the monetary savings by its use. The developers as far as I can see give no hint of this on their website, in fact it is totally void of useful information. At the very least you would think they would give an approximation of payback time, nothing that tells me how long it would take to save $28 in electricity. Basically it says a 200 watt computer will drop to about six watts on standby. Hopefully the developer will chip in and give an indication of these important points. Before I install this I want information that gives an indication of the monetary savings by its use. The developers as far as I can see give no hint of this on their website, in fact it is totally void of useful information. At the very least you would think they would give an approximation of payback time, nothing that tells me how long it would take to save $28 in electricity. A little bit of information regarding the power consumption of a computer is given at the following link:- http://michaelbluejay.com/electricity/computers-sleep.html Basically it says a 200 watt computer will drop to about six watts on standby. Hopefully the developer will chip in and give an indication of these important points. "Before I install this I want information that gives an indication of the monetary savings by its use." I think it depends almost entirely on the device & how it's set up. I haven't kept up with AMD, but for Intel the different power saving modes as set in the bios can get a bit complicated, requiring some research. This Wikipedia article *may* provide a very brief intro, though it appears out of date. DO note that it's also important to research your device, as not only will the options differ, but in real life some will just not work, depending on the device. Next there are options, again depending on the device, like suspend to RAM, which can seem to the user as if an older PC went into Stand By mode, yet consume just a trickle of power. Otherwise in Windows you can control how & if Windows will do stuff like turn off USB devices, hard drives etc., & Sleep, Hibernation, or a hybrid of both. Again it's useful to research your device or hardware, as often not every option will work. It's also a bit common for devices to go to sleep or hibernate when your intent was to turn the device off -- you can often [usually?] set that behavior in Windows. Today's GOTD, AutoStandByPro, won't alter what your device can do, but it should make it a bit easier to set Windows power saving features. "Basically it says a 200 watt computer will drop to about six watts on standby." Well, I don't have the latest / greatest, but this rig with a i7, an OK graphics card, & a 750 W power supply, has been dropping as low as 6.5 W for the CPU, with the graphics card dropping into a similar power saving state whilst I've been typing this, so IMHO that's a bit out of date. AFAIK the best way to find out what the actual power draw is, is to use something like a Kill-A-Watt meter [~$20 at Home Depot] -- you can often get a ball park figure on what to expect by reading reviews of whatever CPU you're running, as they'll use one of those meters. Tata, <i>"Before I install this I want information that gives an indication of the monetary savings by its use. "</i> I think it depends almost entirely on the device & how it's set up. I haven't kept up with AMD, but for Intel the different power saving modes as set in the bios can get a bit complicated, requiring some research. This Wikipedia article *may* provide a very brief intro, though it appears out of date. DO note that it's also important to research your device, as not only will the options differ, but in real life some will just not work, depending on the device. wikipedia[. ]org/wiki/Advanced_Configuration_and_Power_Interface Next there are options, again depending on the device, like suspend to RAM, which can seem to the user as if an older PC went into Stand By mode, yet consume just a trickle of power. Otherwise in Windows you can control how & if Windows will do stuff like turn off USB devices, hard drives etc., & Sleep, Hibernation, or a hybrid of both. Again it's useful to research your device or hardware, as often not every option will work. It's also a bit common for devices to go to sleep or hibernate when your intent was to turn the device off -- you can often [usually?] set that behavior in Windows. Today's GOTD, AutoStandByPro, won't alter what your device can do, but it should make it a bit easier to set Windows power saving features. <i>"Basically it says a 200 watt computer will drop to about six watts on standby. "</i> Well, I don't have the latest / greatest, but this rig with a i7, an OK graphics card, & a 750 W power supply, has been dropping as low as 6.5 W for the CPU, with the graphics card dropping into a similar power saving state whilst I've been typing this, so IMHO that's a bit out of date. AFAIK the best way to find out what the actual power draw is, is to use something like a Kill-A-Watt meter [~$20 at Home Depot] -- you can often get a ball park figure on what to expect by reading reviews of whatever CPU you're running, as they'll use one of those meters. No good. And I'm first. Now this I could use on my WIn 10 that won't sleep automatically, but I see it is old code and not Windows 10 compatible - shame, may have solved a nine month old problem. Nigel, it runs fine on my Windows 10 64 Home desktop. But it is a free version, no pro. So I can only define one rule??? Nigel, it runs fine on my Windows 10 64 Home desktop. But it is a free version, no pro. So I can only define one rule??? I've downloaded it under win 10 64 bit and it's loaded and run and I've set up a simple profile. Time will tell if the profile cuts in at the appropriate time. Nigel, I've downloaded it under win 10 64 bit and it's loaded and run and I've set up a simple profile. Time will tell if the profile cuts in at the appropriate time. First off, thanks for the replies about working on Windows 10 everyone. Secondly, ericN.... I don't know, I've spent hours and hours day after day trying every suggestion under the sun to get it to sleep, but it won't automatically, even though I can send it to sleep manually. On the other hand My laptop went to sleep too soon, but after a couple of months I found a registry hack that solved that problem. Because of the "sleep" problem, I stick to my Windows 7 system and only open 10 now to update it occasionally. ericN, First off, thanks for the replies about working on Windows 10 everyone. Secondly, ericN.... I don't know, I've spent hours and hours day after day trying every suggestion under the sun to get it to sleep, but it won't automatically, even though I can send it to sleep manually. On the other hand My laptop went to sleep too soon, but after a couple of months I found a registry hack that solved that problem. Because of the "sleep" problem, I stick to my Windows 7 system and only open 10 now to update it occasionally. On the Power and Sleep screen at the bottom, click on Additional Power Settings to choose what the computer (if a laptop) should do when you close the lid. Nigel, go to: Setting -> System --> Power and Sleep You can set your sleep settings there. If your computer is not sleeping when it should, check what is running - you may have installed some software that is preventing sleep On the Power and Sleep screen at the bottom, click on Additional Power Settings to choose what the computer (if a laptop) should do when you close the lid. Directed really at Nigel again .. but YES indeed.. you should be able to.. via Power Settings.. set your computer in even minutes let alone Hours, to do as you wish.. Hibernate - Sleep - Shut Off .. whatever. It MAY be that someting is running permanently and whilst not all little progs may do so it could be something that IS running and Power Settings do not think you want to Shut-down or whatever.. but in general, a Power Setting will not be over-ridden by any such small thing and if you set it to say Hibernate or Close in x Minutes...that it will do. No disrespect, but that sounds like a "Microsoft answer". If only computers were that easy. "powercfg /requests" and a whole host of other commands. I have updated drivers, and in one instance downgraded one driver, Intel Management Engine Interface (I think, but without opening the system and checking back I can't swear to that). Anyhow, the driver concerned was supposed to cause problems with sleeping, but it didn't help. And yes, I have checked for BIOS updates too. According to the above commands, run in powershell as administrator - there is nothing making requests to the system and nothing keeping it awake - Yet it still won't sleep. I even tried the registry hack that I used on my laptop to stop it sleeping too soon, all to no avail. alordofchaos, No disrespect, but that sounds like a "Microsoft answer". If only computers were that easy. I have tried "powercfg -lastwake" "powercfg /requests" and a whole host of other commands. I have updated drivers, and in one instance downgraded one driver, Intel Management Engine Interface (I think, but without opening the system and checking back I can't swear to that). Anyhow, the driver concerned was supposed to cause problems with sleeping, but it didn't help. And yes, I have checked for BIOS updates too. According to the above commands, run in powershell as administrator - there is nothing making requests to the system and nothing keeping it awake - Yet it still won't sleep. I even tried the registry hack that I used on my laptop to stop it sleeping too soon, all to no avail. "I could use on my WIn 10 that won't sleep automatically"
Google. There's been quite an emphasis on power saving technologies for the last several years, so it can get complicated understanding the various related bios settings, plus some of those setting will often just not work with some hardware. So Google on your specific brand & model device to find out what settings are available in the bios, which settings work best, & which don't work at all. You may also find that there's an updated bios available just to cure your problems. Armed with that info, Google on the choices you have, so you understand what they do, & then you can make an informed decision on what to try. Next it's time to tackle Windows -- if your hardware isn't set to do something, whatever you set in Windows may well be irrelevant, & that's why I take a bios 1st approach. If you still have a problem after tackling the bios settings, again it can be helpful to Google on your brand & model device, because it just may not work well in certain modes &/or with certain settings. Design faults re: power saving are fairly common, e.g. lots of folks have to turn off hibernation. Since 95 or 98 or something Windows has always based it's power saving features on the new tech available at the time it was released. And there have always been devices where power saving stuff wouldn't work 100% after upgrading to that Windows version. Nigel, <i>"I could use on my WIn 10 that won't sleep automatically"</i> Google. There's been quite an emphasis on power saving technologies for the last several years, so it can get complicated understanding the various related bios settings, plus some of those setting will often just not work with some hardware. So Google on your specific brand & model device to find out what settings are available in the bios, which settings work best, & which don't work at all. You may also find that there's an updated bios available just to cure your problems. Armed with that info, Google on the choices you have, so you understand what they do, & then you can make an informed decision on what to try. Next it's time to tackle Windows -- if your hardware isn't set to do something, whatever you set in Windows may well be irrelevant, & that's why I take a bios 1st approach. If you still have a problem after tackling the bios settings, again it can be helpful to Google on your brand & model device, because it just may not work well in certain modes &/or with certain settings. Design faults re: power saving are fairly common, e.g. lots of folks have to turn off hibernation. If there doesn't seem to be any common problem with your device when you Google, it could be one of the many setting's having to do with turning off components like Wi-Fi, which you've probably tried already, or it could be some software you've installed, or it could be that Windows install is broken, or it could be your device's power saving doesn't work 100% with 10 if it was designed for an earlier version of Windows... Since 95 or 98 or something Windows has always based it's power saving features on the new tech available at the time it was released. And there have always been devices where power saving stuff wouldn't work 100% after upgrading to that Windows version. Nigel, Windows 10 has a Sleep issue. It wakes from Sleep all by itself which is a problem if its tucked up in a laptop bag! I had this with my Ultrabook and it fried the battery! I have a new laptop now and I Hybernate it, never Sleep it. krypteller, The reason you are getting this message is because in the upper left hand box you have to add a "NAME" for your rule, once you add a name it will let you create the rule so long as you have all of the other options defined. This is the PRO version, you can add as many rules as you want. My primary use for this software is to keep the screen display from going to sleep when I run specific programs such as watching a streaming video or long movie on my browser, or watching a movie in my movie player. This way I can keep my screen saver settings and other sleep settings with Windows the same. 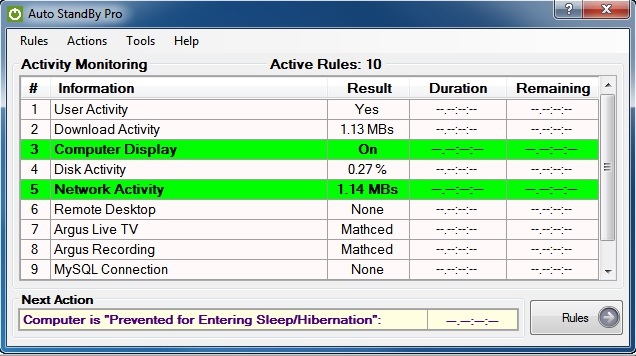 While I realize there is the Don't Sleep freeware option to do this among others, I do like the fact that this program is a "Make a Rule" and set it and forget it where turning sleep & other aspects on or off can be made automatic without addition interaction. krypteller, The reason you are getting this message is because in the upper left hand box you have to add a "NAME" for your rule, once you add a name it will let you create the rule so long as you have all of the other options defined. This is the PRO version, you can add as many rules as you want. My primary use for this software is to keep the screen display from going to sleep when I run specific programs such as watching a streaming video or long movie on my browser, or watching a movie in my movie player. This way I can keep my screen saver settings and other sleep settings with Windows the same. 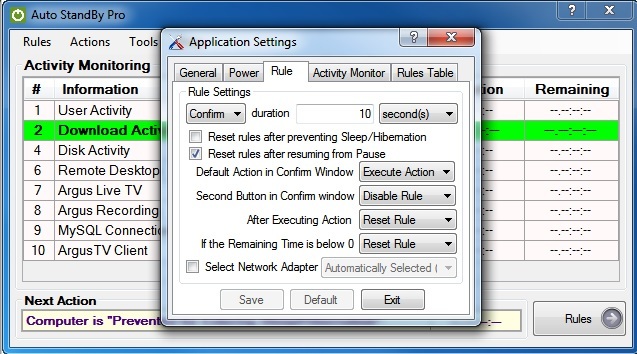 While I realize there is the Don't Sleep freeware option to do this among others, I do like the fact that this program is a "Make a Rule" and set it and forget it where turning sleep & other aspects on or off can be made automatic without addition interaction. Yes, I was hoping by now, ten months after it's debut that microsoft would have solved the problem. I have literally spent full days on the problem, and still do every so often, but until it's "fixed" or I find a solution that works, I stick to my Windows 7 system. I would never have bought a windows 10 system had I not got earlier systems as backup. Microsoft are the pitts. Fortunately after a few months with my laptop, I got that working as I want, that is until microsoft force an update that messes everything up but I do keep regular backups, and have the ability to stop forced updates should I need. john, Yes, I was hoping by now, ten months after it's debut that microsoft would have solved the problem. I have literally spent full days on the problem, and still do every so often, but until it's "fixed" or I find a solution that works, I stick to my Windows 7 system. I would never have bought a windows 10 system had I not got earlier systems as backup. Microsoft are the pitts. Fortunately after a few months with my laptop, I got that working as I want, that is until microsoft force an update that messes everything up but I do keep regular backups, and have the ability to stop forced updates should I need. Thanks for suggestions, but as previously mentioned, there is no BIOS update. My computer is home built, at the end of last year with all the latest devices and is also the same system that I run my windows 7 from, without a hitch. I am certain the problem is with Windows 10, there's enough complaints and reading about it in google. mike, Thanks for suggestions, but as previously mentioned, there is no BIOS update. My computer is home built, at the end of last year with all the latest devices and is also the same system that I run my windows 7 from, without a hitch. I am certain the problem is with Windows 10, there's enough complaints and reading about it in google. No offense taken, impossible to know a person's familiarity with computers on first "meeting." Next step I would try is to go through and disable any new "features" in Win10. Disable Cortana (and kill any associated running processes), set "get updates from more than one place" to OFF, etc. Reboot, double check to make sure they are still OFF, and each day, turn one back on and see if it works like it should. Hi, Thanks for still coming up with suggestions, but as it happens, I have everything possible turned off where it comes to "Microsoft spying". I also have the "peer to peer" updates turned off, in fact at the moment, because something in the last round of updates stopped my "Classic Shell" start menu from working, I even have ALL Microsoft updates turned off. I have everything in Device manager that can wake windows turned off, except for the mouse (I have tried it with the mouse also turned off) . I'm not sure if I mentioned I can make the computer go to sleep, it just won't do it as per the settings. Off topic, the system also tries to install an update, I forget the KB number off hand, but every time that particular update fails, others install. I've even downloaded that particular update and tried to install it ... still no luck, so for now, I keep using my Windows 7 (same hardware) and wait for the next major win 10 update in the hope that it fixes some of it's problems, as well as, unfortunately re setting some of my earlier changes. I also have to have the Classic start menu, I can't be doing with all those tiles and not being able to navigate around my own computer. alordofchaos, Hi, Thanks for still coming up with suggestions, but as it happens, I have everything possible turned off where it comes to "Microsoft spying". I also have the "peer to peer" updates turned off, in fact at the moment, because something in the last round of updates stopped my "Classic Shell" start menu from working, I even have ALL Microsoft updates turned off. I have everything in Device manager that can wake windows turned off, except for the mouse (I have tried it with the mouse also turned off) . I'm not sure if I mentioned I can make the computer go to sleep, it just won't do it as per the settings. Off topic, the system also tries to install an update, I forget the KB number off hand, but every time that particular update fails, others install. I've even downloaded that particular update and tried to install it ... still no luck, so for now, I keep using my Windows 7 (same hardware) and wait for the next major win 10 update in the hope that it fixes some of it's problems, as well as, unfortunately re setting some of my earlier changes. I also have to have the Classic start menu, I can't be doing with all those tiles and not being able to navigate around my own computer.